From the large pool complex to the ultra-modern mobile homes, every inch of the Hippocampe Campsite is beautifully designed and kept. Whether you want to chill-out or take part in fun activities, this luxury campsite has everything you need for a memorable trip. 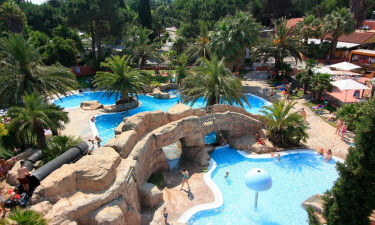 Book you stay early and you could save some money off of your luxury camping holiday to Argelès-sur-Mer. Why Should I Stay at the Hippocampe Campsite? There are three different luxury homes from which you can take your pick. All mobile homes come with a large living and dining space with sofa beds, French doors that lead out onto a decking area, private bathroom, kitchen with fill-size hob and oven, microwave, fridge-freezer and iPod docking system. You can pre-book your towels and bedding to have them all ready for you on arrival. Each of the mobile homes come with a nearby parking spot, which makes it quick and easy to unpack your belongings, plus a fun welcome pack will help you to get settled in. Contact LUX-camp representatives for more information about the accommodation options available. What Amenities are Offered at the Hippocampe Campsite? A highlight is the large outdoor heated swimming pool complex which features palm trees, water chutes, waterfalls and a bubbling Jacuzzi. The sun terrace area provides a lovely area where you can relax in the sun, while the kid's pool area is perfect for your little ones to splash around in. Live music and entertainment is held most nights at the LUX-camp. Game-lovers can take part in the regular sport tournaments, play pool, table football or even pinball. Laundry and sanitation amenities include dish-washing sinks, laundry sinks, washing cubicles, washing machines, dryers, hot shower blocks, baby changing facilities and iron-hire. Hippocampe Campsite is located just 1km away from the beautiful golden sandy shores and shimmering Mediterranean waters of Argelés Plage, and near to the pretty town of Argelés sure Mer and Collioure. 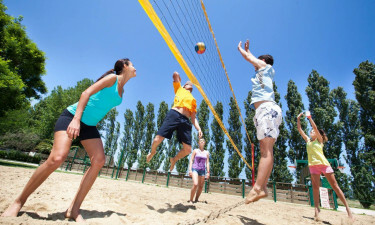 Local activities include bowls, tennis, bike trails, scuba diving, bowling, fishing and boat trips. Keen golfers can play the green at the full-size golf course which is just 8km away from the luxury camping area, while thrill-seekers can zipline over forests and walk the high wires at the nearby Argelès Aventure Park. Are There Places to Eat and Drink On-Site? 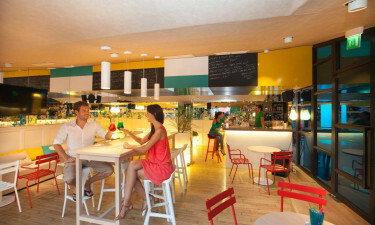 Yes, there is a restaurant which serves delicious European-inspired cuisine and filling snacks at affordable prices. There is also a bar where you can enjoy a frosty beer, local wine or soft drink in the sunshine. There is even plenty of restaurants, cafes and ice cream parlors all located within several minutes’ drive of this luxury camping site for your enjoyment. Just a few minutes’ travel away, there are a number of grocery shops available.